Displays a menu with which directories or Velocity script files can be created. Furthermore, you can also import externally created Velocity script files. Opens the script editor where the currently selected script file can be edited. 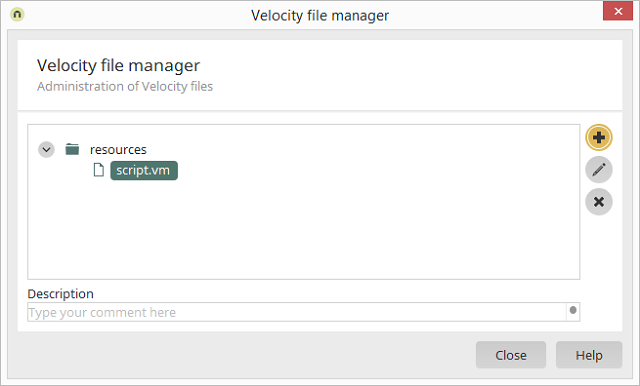 Every element in the Velocity file manager can be moved to the desired position via drag & drop. If you select an existing directory, you can then create subdirectories. Deletes the currently selected element. At the bottom of the dialog, the text, which is defined as a comment at the beginning of the Velocity file, is automatically shown. Please take note of our security notice.